In 2014, DSP surpassed 100,000 Lifeline wireless distributions across the country. In the state of Oklahoma, they are the largest Lifeline wireless distributor, which is one of the most regulated and saturated state markets in the nation. In California, DSP has recently exceeded 10,000 Lifeline wireless distributions a month with operations in multiple markets. Direct Sales Professionals will be attending the National Lifeline Association's 2015 Spring Conference in New Orleans. Please take a moment to introduce yourself, we'd enjoy the opportunity to meet and talk with you. *Eligible recipient figures are households enrolled in SNAP as reported by USDA, February, 2015. Direct Service Professionals is one of the leading companies enrolling qualified customers in the Lifeline wireless program. Over the past four years, Oklahoma has been one of the most visible and scrutinized states by the FCC and USAC. This has led to all Lifeline companies undergoing strict government and state compliance, along with a heightened focus on eliminating waste, fraud, and abuse. Out of these federal and state changes, DSP has become the most effective, legally compliant, and forward-thinking distributor in Oklahoma. Their commitment to 100 percent accuracy, a continual training program, and their ability to effectively use different enrollment systems has propelled them to the best in the business. Comprehensive and personalized training for corporations, organizations, and sales professionals to understand and succeed in the Lifeline market is available. 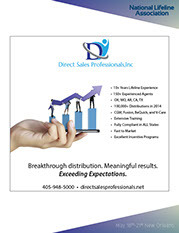 Our relationship with Direct Sales Professionals has been great from the beginning. Very early on, we noticed the passion and work ethic they bring to the business. They are a true professional organization that treats their business relationship with a professional flair rarely found anymore. We are excited and proud to be able to call them partners in our business. I have worked with Direct Sales Professionals for more than a year. Their management team is extremely pro-active and responsive. The agents under the tent are of the highest caliber of professionalism. Their attention to compliance and inventory is unparalleled. One of the primary reasons Direct Sales Professionals has seen such high growth rates and success is due to our close partnership with Assist Wireless. Our partnership has been an inspiration to every level of our organization and been a model of how an ETC / ISO partnership should operate. The level of support and leadership Assist Wireless has demonstrated is truly beyond what was expected. They gave us tools to learn, grow, and become highly efficient in all levels of our organization. Throughout our partnership, they have always listened to our ideas and needs, then put them into action. I believe both companies have grown and improved immensely to become industry leaders.